The usual crowd of Year Eight girls were huddled round their phones, squealing, their voices bouncing back and forth across the canteen. It was part of their daily ritual to read their favourite fan blog aloud over lunch, but today they were being particularly...well...squeally. I could hardly concentrate on my book. Everyone knows I LOVE a good love story. Throw in one of the biggest bands in the world and I'm completely sold on a book. 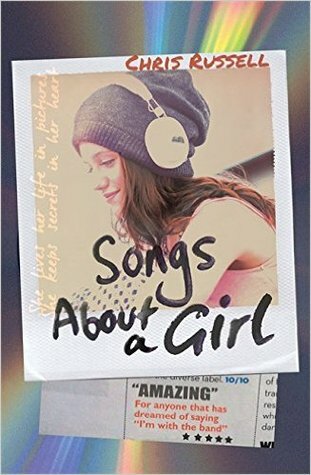 Songs About a Girl is a gorgeous page turning romance from start to finish. This is the book that teenage dreams are made of! I loved this book as much as I loved Love Song by Sophia Bennett! I got completely lost in the story. The beginning of the book has a similar pattern to Love Song, where Charlie gets invited to work for the group. Charlie is an amazing photographer and it seems local boy, turned heart throb, Olly hasn't forgotten it from their time together at school. Charlie is soon caught up with the drama of being photographed regularly with the band and social media nearly breaks her. You really get to see how nasty people can be, when they are jealous. There is a subtle love triangle in the story between Charlie, Olly and broken boy, Gabriel West, which never reaches a tense ultimatum. It's all dealt with quite amicably. All I can say is that the right guy gets the girl in the end. I loved how innocent Charlie was and how she got swept up in this unknown, paparazzi filled world. You get a real picture of what it must feel like to look out at all the adoring, screaming fans and how exciting yet often scary it can be. Fire and Lights heavily resemble One Direction and you realise what a shock to the system it must have been to go from being a normal person to one of the biggest stars in the world. I loved the ending! Oh it made my heart swoon! I want to know what happens next! Please, please, please let there be a sequel! I want to know what happens with the other three gorgeous boys in the group. Surely Charlie's best friend, Melissa, ends up with one of them! A gorgeous summer read full of love, glamour and music, not to mention a whole soundtrack to download to go with it. If you are big on boy bands, then this book is definitely one to add to your collection.